Very sweet, Dawn was always my favourite. A lovely story with a perfect ending. I would definitely recommend it, especially if you've read the other two books in this series. 4.0 out of 5 starsA Beautifully Written Story of Love and Strength..
Having fairly recently come across the writing pair of K.A. Merikan, I have yet to fully comprehend how their writing style seems to always amaze me every-single-time I have read one of their books. And, this time was no exception. I absolutely loved You. Forever. Always., and am so glad to have had the opportunity to have read such a wonderfully touching and immensely heart-warming story from this talented writing duo.. So, it is fairly safe to assume that as soon as I had discovered the next book of The Underdogs Series would be out soon, I may have squealed a bit, I may have ran, and, I may have put all other reading aside, as the previous book, Just Here For The Pain, had blown-me-away with its gritty, darkly gripping, equally emotional, incredible style-of-writing, that I normally do not gravitate towards, but had changed my mind for future reads from this writing pair. Case in point, my current read. You. Forever. Always., by K.A. Merikan was such an emotional, heart-breaking, gripping, slightly humorous, heart-warming, and, definitely tissue-worthy type-of-read. While the storyline did appear to be an actual continuation from the previous book of the series, it's current plot could still be followed, while at the same time, a recommended read of the entire series, let alone the previous book, would definitely contribute to the overall comprehension of this current new release. Its beautifully simmering chemistry, moderate angst, and, emotional tactile need, were only some of the heady components of this highly-anticipated read, that for this reader, had me eagerly hoping for even more from this series as I continue to absolutely love it. As You. Forever. Always. was a continuation of such an addicting series, there were many cameos, which enabled me to re-visit with the other great characters and be able to easily recall their individual storylines all over again. It was such a joy to be immersed within the lives of these talented musicians, added friends, and loved ones. 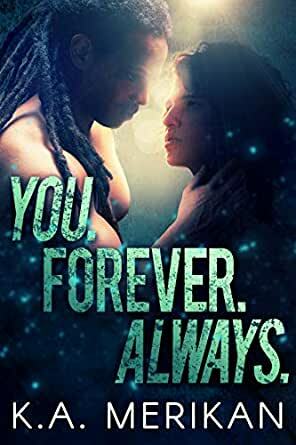 I was so incredibly happy to see Dawn and Mage once again, as I have loved them throughout this series, and was so over-the-moon with their insatiable love and necessary strengthening bond, that their story was just icing on the cake.. Otherwise, let it go! That’s the lesson in this fable of tender love and loving. Expressing oneself through song takes on the sweetness of the boy and the strength of the man. Mage and Dawn were sickeningly sweet and the only reason I got through this book was because I have much love for K.A. Merikan and didn't want to DNF my ARC. It's not that the plot was terrible or even that the writing was bad it's just that this type of fluff oft times leaves me nauseous or spasming in disgust because it's so unbelievable. Dawn for much of this was a delicate flower, hyper sensitive and overly sweet. He cried, experienced severe anxiety, blushed and fainted at the slightest hint of conflict and I was bored with him after the third chapter honestly. Then there was Mage, this overprotective shadow of Dawn's. A man who's bisexuality was a secret until his relationship with Dawn exposed the truth, other than the fact that he's a member of the Underdogs I'd say that I didn't find his character to be interesting either, he was likable but not enough to keep me entertained for the duration of his and Dawn's romance. If you're looking for cute, fuffy, fairytale fodder, look no further you'll find it here, You. Forever. Always. Is low on angst and heavy on syrupy sweetness so if that's your thing give this one a try, as for me, I think I got enough sugar from this one to last me the whole of 2019. 5.0 out of 5 starsSuch an amazing story with such wonderful characters! I have to say that this is the first book in this series that I have read *gasp* I know right! I do however have to say that I absolutely loved Mage and Dawn's story and thought it was so beautiful and sweet. Mage is one of the members of The Underdogs and has known Dusk and Dawn since they were kids. He has always been Dawns protector and knight in shining armor and he has been in love with Dawn for quite awhile as well. Being best friends with Dusk he never planned on acting on his feelings for Dawn. Until a drunken kiss in a hot tub changes everything. Mage is a great character and I found that he was really relatable. He walked away from the lufe that was expected of him to follow his dreams yet he strives to make it in order to make his parents proud and to feel kinda validated that he could make it in the music industry. I love how he protected Dawn and how much he loved him and wasn't afraid of that. Dawn is the songwriter for The Underdogs and the younger brother of Dusk the lead singer. He suffers from extreme anxiety and shyness that keeps him from really living his life. He was so sweet and innocent and it just made you want to hug him and protect him. When he gets the courage to kiss the man he has been in love with for as long as he can remember it changes everything. Soon he is living a dream as he and Mage flow into a relationship together and he is happier then he has ever been. Dawn was such a wonderful character that really brought a lightness to the story but also a depth and offered a glimpse into what life is like for someone who suffers from anxiety issues. I loved the way their relationship developed and flourished. It was a slow burn because of Dawns shyness and it just fit with them. I thought that they were so perfect for each other. I also liked getting to know the other characters from the previous 2 books. Dusk and Lolly who were outrageous and funny and made me laugh often and Sid and Asher too. This was all around a wonderful story and I definitely recommend reading it!